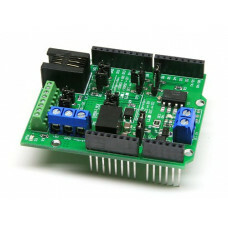 The ARD-DCCSHIELD is an optoisolated interface shield for connecting an Arduino (as a decoder) to a model railroad DCC control system. 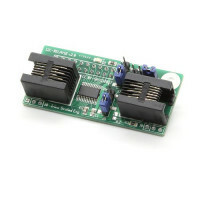 The board has provisions for sending a DCC ACK pulse, connecting I2C accessories and general purpose I/O lines, as well as optionally powering the Arduino from DCC power and providing up to 400mA of 5VDC to connected circuitry. 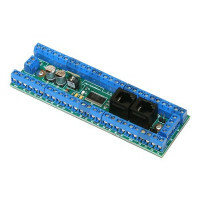 The board is designed to be compatible with various DCC decoder libraries and Arduino boards. We typically use Alex Shepherd's excellent NmraDcc library. Note: The board implements the functionality necessary for being a decoder. It does not implement the ability to generate DCC signals (ie, act as a command station). Note: Arduino is a registered trademark of Arduino AG. This is very much a “because I could” project, so keep that in mind… I built the SDX-1 soon after it appeared in Model Railroader in 1991. It served its purpose, both on my home layout and at several NTrak layouts with which I was involved. However, it has sat dormant for many years. A few months ago, I started to wonder what it would take to DCC enable it (it was originally intended to be used with DC throttles). So, with an Arduino and a little code, I now have a sound system that can make an N-scale diesel shake the room (literally!). Keep in mind that the sound on the recording doesn’t do justice to the low frequency components. It’s much better to hear (and feel) in person. And yes, there are many other ways (maybe even more practical) to do this. 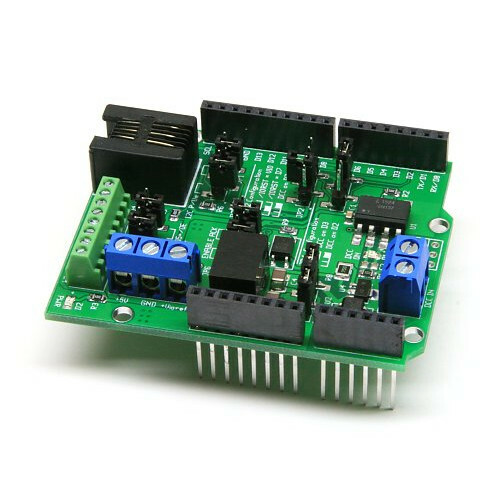 This, however, was intended more as a fun application and test of the DCC Arduino Decoder Shield than any practical application. As for the equipment seen in the video, from left to right, there is the SDX-1, an Arduino + DCC shield, a very crude level-shifting PWM DAC (i.e. a single transistor), and the Lenz DCC base station. The SDX-1 is driving the speaker itself (out of view below, sitting on the floor).